Whether you’re a business executive or a seasoned IT pro, using managed services can make your job easier. When effectively executed, a Managed Service is like gaining the capability of an IT Department with the expertise of seasoned professionals to deliver focused application operations to your company’s business application users. Simply put, a Managed Service is designed to handle the daily operations of your specialized applications providing the capability to your company end-users and therefore allowing in-house IT to focus on more strategic IT programs, also freeing your team to focus on your business’ core competencies. This shows up often when IT professionals notice a decline in the current repository of knowledge, reducing the quality of IT service to your company. From my experience working with small and large client companies alike, I often suggest how a managed service can help address these challenges. 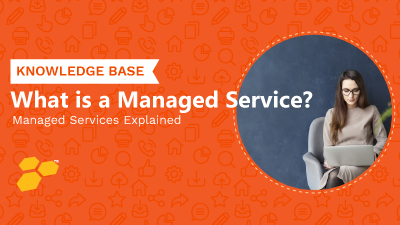 In my career, I have worked with many clients that are utilizing managed services in a variety of ways. Most recently, I provided a managed service to a large energy company which found the service to be seamless and significantly improved the satisfaction of end users and IT support staff, globally. If you’re sensing some of these dynamics at your company, here are some personnel and technology suggestions on how you can reorganize and empower your IT Department for growth via Managed Service. Today, IT managers are under significant pressure to meet the performance, operational expectations, and security needs of the business while trying to keep costs down. Most of the financial experts would suggest in these conditions to switch to a predictable cost model, like that of a managed service. A company that provides such services is called a Managed Service Provider (MSP). The best time to consider speaking with a MSP is when you are setting future strategic goals or deploying new services to your IT environment. Many times, a company’s existing staff may not be experienced with a new technology or able to maintain new services or applications. Hiring contractors to provide the service may be more expensive and provide less value in supporting your company’s ever-growing performance goals, given astatic or declining budget. This is often true for small, medium and large companies alike. For most business services, IT underpins the business engine. From software to hardware and the skills required to keep the service running, a company could invest significant capital in building and maintaining the in-house support staff. However, given the maturity of the managed service models and the shift to virtualization and cloud, the need for on-site IT staff can be limited to the exceptions where operational sensitivity justifies it. To ensure greater IT cost predictability amid uncertain requirements, a company may consider leveraging managed service experts. MSPs usually price their services on a subscription basis. Based on the services selected, the pricing is usually scoped on the number of devices with pricing aligned to packages across a range of categories. Some provide customer support on-site when required. Basic services often start with a monitoring service, which identifies potential issues, which you resolve on your own. At the other end of the spectrum, service providers offer comprehensive managed services that cover everything from alerts through problem resolution. Better Cost Control: Cost factors for a business service depend on an organization’s requirement for availability and criticality of a particular service. The typical cost components of an IT department, including training, equipment and personnel, are absorbed by the MSP and presented as a fixed monthly charge to the company. This helps in effectively predicting costs every month when budgeting. Depending on the future requirements and the speed of the your organization’s IT maturity, the managed service can scale to address such scenarios. The biggest benefit is that a company can decide how much to scale based on factors that may include finance and the CIO’s strategic vision. IT Service interruptions and outages can also be prevented, thus mitigating the risk of further losses. In terms of the energy company, the client went from multiple daily outages to one scheduled outage a month. Improved Risk Management: Every business carries a certain amount of risk. This can be minimized by lowering the individual risk involved with each business service identified as critical. A MSP can help reduce risk by contributing their own proprietary methodologies and access to modern infrastructure and software. This enables adherence to best practices and minimizes risk involved in the service delivery. The MSP assumes and manages much of the risk for the company it serves by having specific industry knowledge, especially around security and compliance issues. They can partner with your business and guide you on the best way to avoid risk in your domains of expertise. High Availability, Efficiency and Productivity: For an IT Service, the saying time is money” always applies. For optimal company performance, constant availability of a mission-critical IT services are the top priority for many organizations. While assessing the true cost of downtime is hard, it is always recommended to take proactive steps to avoid it completely. At worst, reputational risk could be a factor when the outage comes to the attention of those outside the company potentially eroding public trust. Clients experience better performance with minimal downtime when using a managed service. Many times, mission-critical applications involve multiple technologies and require them to be fully operational and integrated to achieve the IT service expected. All component applications must be available together for the IT service to function seamlessly for internal end-users. A MSP can ensure maximum uptime and minimal service interruptions. Organizations that attempt to implement and support all IT services in-house usually have a much higher research and development cost as well as longer timelines to deploy –costs may also be passed on to the organizations wishing to consume these services. The MSP is highly efficient in delivering IT services in a way that keeps costs low and the time to deploy short while providing a high-quality service to the business. Future Proofing IT Services: IT departments will always have funding, technical, security, and operational challenges. As you look for strategies to minimize spend, I have seen many organizations effectively utilize AMS to achieve the full benefit of seamless service integration with less worry over resource constraints. MSP’s will always have their staff trained on upcoming and new releases as well as new technologies with the ability to lock-in costs for a multi-year period. By creating more predictability, your business will reduce operational risk, challenges and minimize service disruption. Managed Service Providers bring not only practical delivery of a predictable service model and cost to quickly and effectively deliver new IT service to an enterprise, but also enhance the stability and peace of mind for IT and business leaders alike. The task of delivering new business services to the enterprise while keeping costs controlled is a difficult task in the modern business environment. A managed service is a great strategy to help your IT organization be highly resilient, and cost predictable, fiscal year to fiscal year. MSPs complement and do not replace existing staff but rather free those valuable resources to lead and deliver on the strategic IT programs necessary to advance business goals. In larger organizations, an MSP will help your resources to focus on more strategic projects. You can rest assured that your company is minimizing the risks associated with maintaining client data and sensitive competitive information and more with today’s managed service offerings. As you embark on investing in a new application, consider taking advantage of various managed service offerings to stay on top of IT business needs and minimize unsystemic risks. Tarun Kumar is a Senior Consultant with BMC Global Services. He is an expert in the design and deployment of enterprise level solutions, system and data migration strategies as well as custom application development. He has more than ten years of progressive IT experience that spans multiple disciplines and industries. Tarun is responsible for scoping, developing, enabling and delivering Remedy and other integrated Digital Service Management applications. He also leads engagements developing roadmaps, value realization plans and IT Architecture and delivery program plans. For the past several years, Tarun’s focus has been on the IT Service Management suite and Application Managed Services. He has a wealth of experience in integrations, analytics, asset management and Remedy.